Overly ripe bananas somehow ALWAYS find their way into my kitchen. Being a green banana fan, I just can’t get myself to eat a black spotted banana. I usually try and pawn them off onto my husband by sneaking them into his lunch bag. He’s not a ripe banana fan either though (is anyone?! ), so he brings them home. I hate wasting food, which means I’m constantly thinking of new ways to use up ripe bananas. (Here are a few favorite recipes of mine that call for ripe bananas fyi: banana bread, banana n’oatmeal, banana malpua, banana fudge & this smoothie). The problem is that I have recipe ADD and get bored really easily when I make/eat the same foods. I suppose that my recipe ADD is good news for you – because I mean, can you really have enough recipes that call for ripe bananas? No. No you can’t. 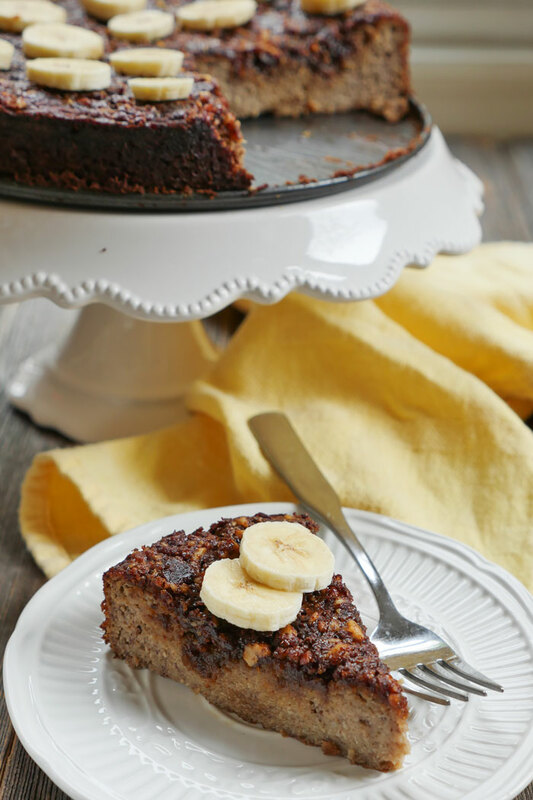 Because you know what happens without a variety of recipes that use ripe bananas? Children end up hating banana bread as adults because that’s all their mommas ever made with their overly ripe bananas. True story. This my friends is not banana bread. It is is banana CAKE. excuse me. It’s banana coffee CAKE. It’s so soft, so moist, so sweet and so delicious. And to make this cake even more decadent, it’s topped with a mixture of coconut sugar, pecans and grassfed butter (or ghee). Do you see that sweet, buttery crumb? This cake is tooooo good. 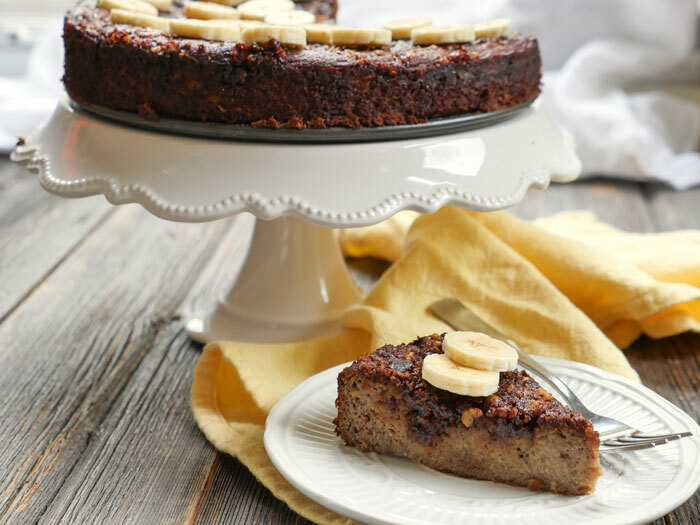 If you don’t have ripe bananas sitting on the counter nagging you to use them up then you can always make my cinnamon coffee cake which is just as good as this banana cake. I’m kind of tempted to make both and see which I like better. I’m not even sure – it’d be a close call. 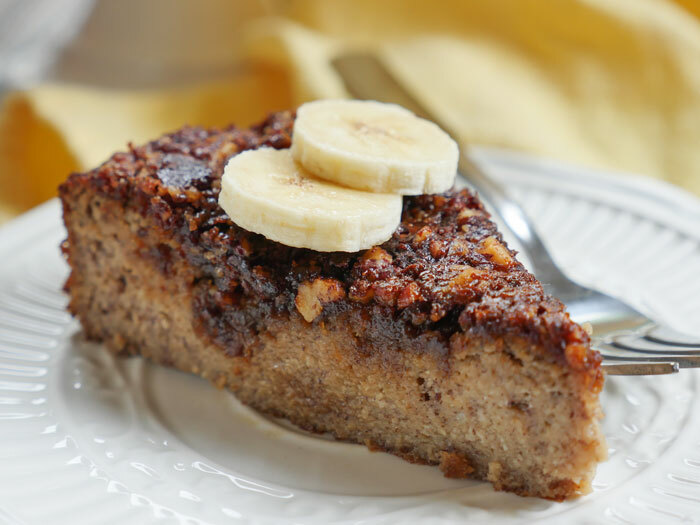 I know both are versions of coffee cake, so they’re “acceptable” as breakfast food – but I feel like the banana cake is more “acceptable” since it has, you know, bananas. Preheat oven to 350F using the convection setting if available. Add the almond flour, coconut flour, baking soda, salt and cinnamon to a bowl and mix well. Next, mash or puree the bananas if you haven’t already, then add this to the bowl along with the eggs, ghee, maple syrup and coconut milk. Mix using a hand mixer until well combined. Allow the batter to rest in the bowl while you prepare the topping. Add the topping ingredients to a bowl and using your hands, mix well. Pour the batter into a greased or parchment-lined 9-inch round pan then sprinkle the topping on top of the cake. Bake at 350F for 1 hour, or until a toothpick inserted into the center comes out clean. Allow the bread to cool, then slice and serve. Thanks, Rebecca! 🙂 I know you’ll love it!! I had the fortune of being able to try this. 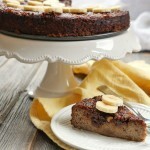 Amazingly moist and the nuttiness of the flour works perfectly with the bananas. I’d recommend a slice of this with a cup of black coffee as a perfect accompaniment. I may “accidentally” let some bananas get a little ripe so I can eat this again. #Tasty #MHB. Hi Josi! I’m not sure how this would turn out without eggs – hopefully a reader will reply if they try. In the meantime, maybe you can make some of my egg-free dessert recipes? You can look through my easily searchable recipe index to find those! I made this last night and it was excellent! The house still smells like sugary cinnamon 🙂 It’s currently 64 degrees here and raining (welcome to the Pacific Northwest in July) so baking house-heating treats like this keeps me from thinking about why it’s too cold to grill outside. Hi Ashley, Can I use regular whole milk instead coconut milk? Hi, I haven’t tried this with whole milk so I can’t say for sure but since it’s such a small amount I think it’ll be fine. Please let me know how it turns out! Holy SMOKES! I made this yesterday afternoon for our “treat” after our Paleo Butter Chicken and Naan dinner and my family ate it up!!! It was so good that it was requested AGAIN today to be frozen for the week! I also made an apple variation that smells unbelievable! I will let you know how that turned out as soon as I get a piece, if I get a piece! ;0) Thanks for sharing your recipes! The apple variation was just as good!!! I used 2 small/medium sized Gala apples (that’s what I had, at the moment). I’d love to know about the apple version, too! It’s been awhile since I’ve cooked, LOL so I have not been around! I used cashews the last time I made it, just as yummy! I made this today and it was wonderful! I didn’t have coconut milk so I used almond milk and it didn’t hurt it at all. Thanks again! I used a 9 inch pan, but next time I’ll try baking it a bit longer anyway and see what happens – maybe it’s my oven. Either way, it’s delicious and half-finished already by my fiance and I in less than 24 hours!!! :-). Thanks again!!! Really good. Not to sweet so it is perfect for me. Used a loaf pan as I don’t have the round one so the crumb topping was a bit thick, but who cares! You’re an angel! thank you for this perfect recipe! Was so delicious and easy to make! Nina, I’m so happy to hear that you liked it! !